There is a new, ultra-high performance 7mm projectile for F-Open and long-range competitors. Berger has introduced a new 184gr F-Open Hybrid Target bullet, which will be the official 7mm bullet of the U.S. F-Open Rifle Team. The new 184-grainer is an advancement over previous 7mm match bullets. As you can see above, the new bullet is longer and sleeker than Berger’s existing 180gr Hybrid Target bullet. The new design gives the 184gr F-Open Hybrid impressive 0.695 G1 and 0.356 G7 Ballistic Coefficients. Compare that to 0.680 G1 and 0.349 G7 for Berger’s 180gr Target Hybrid bullet. Bryan Litz of Applied Ballistics designed the new 184gr F-Open Hybrid to be slightly heavier, slightly longer, and have a more aggressive ogive shape. This gives the new 184-grainer a ballistic advantage over Berger’s existing 7mm 180gr Hybrid and VLD Target bullet designs. This bullet complements the .30 Cal 200.20X Hybrid Target bullet that was released last year in collaboration with the U.S. F-TR Rifle Team. As with that 200.20X bullet, for the new 184gr F-Open Hybrid, Berger took a successful, existing design and optimized the ballistic profile to make it even better. Along with .284 Win and 7mm SAUM used by F-Open shooters, this bullet should work well in a variety of 7mm cartridges. The U.S. F-Open Rifle Team tested the 184gr F-Open Hybrids thoroughly to ensure that they performed as well on target as they did in theory. The results were very positive, and this bullet has been adopted as the official 7mm bullet for the U.S. F-Open team. “The United States Rifle Team 2021 F-Open is extremely excited about the release of the new Berger 184gr F-Open Hybrid. Many members have tested the prototype bullets with outstanding success,” says Dan Bramley, Team Captain. 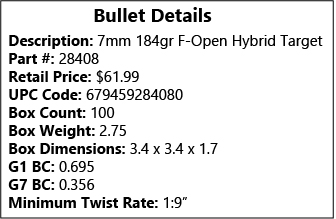 Note: On the Berger website, Berger lists a recommended 1:8″-twist rate for this new bullet. However, in its June 25, 2018 product announcement, Berger states the Minimum Twist Rate is 1:9″. MSRP is $61.99 per 100-ct box, Berger Part #28408. Grafs.com price is $54.99/box. Berger says the bullet, which should be available very soon, will work in a variety of 7mm cartridges including: 7mm-08 Rem, .284 Win (and .284 IMP), 7mm SAUM, 7mm RUM, and 7mm Rem Mag. 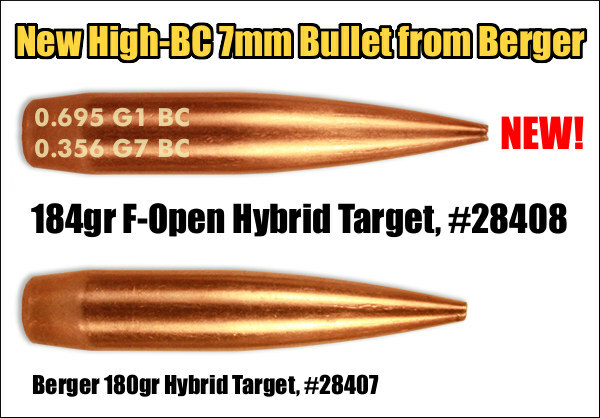 Share the post "New 7mm 184gr F-Open Hybrid Target Bullet from Berger"
Trying to keep up with Sierra and their high BC 7mm bullet. And only .60 a piece. Care to mention the velocity that the published BC is claimed? How about retained Vel at the target? aren’t bergers all BCs from 3000 to 1500 fps? As a customer I sure appreciate refinements and product choices, whether one upping or keeping up, it doesn’t really matter to me. Today’s bullets are almost impossible to improve upon. I’m not selling off my 180’s, the most heat resistant bullet I’ve shot. The 180 Hybrid has 98.03% the new bullet’s G7 BC. It weighs 97.82% as much as the new bullet. If your limiting factor is pressure that loosens up primer pockets, it seems logical that you’ll have to shoot a heavier bullet, somewhat slower. It would be nice to start seeing banded g7 ballistic coefficients. Not that it would make a huge difference, but having that data would be nice.